My motto for myself for the last few months has been, "Out of the juicer and into the cup." I got a juicer for my birthday, and I let everything swirl together in the cannister before I open the cap and watch it splash into a glass. Crazy mixtures of bright things--fresh tumeric, tangerines, ginger, carrots, apples; beets, beet greens, celery, cucumber, lemon. Stuffing all that produce down the shaft, it occurs to me every time that too much input will result in a big mess. And no juice to drink! At some point, all that beautiful, bright juice has to be let out. And, as Elizabeth Gilbert says in her new book, letting out what's inside us, unleashing the "big magic," isn't about being a virtuoso in something. It's not about quitting our day jobs. It's about befriending our fears but never, every putting them in the driver's seat. For me, one of the clogs in the juicer lately has been writing. The more writing I consume in books--articles, on Facebook--the more I labor under this seductive, false idea that I don't have anything to say. That it's all been said. Wow. That really lets me off the hook. Meanwhile, that juicer is spinning, and the liquid is getting dangerously close to exploding all over the place. So here's to letting it pour out. To my health, and yours! Meanwhile, if I'm aware, my eyes are always open to the moments and people in my life who are figuring out how to let their juice fill the cup. My friend, a single mother of 3 special needs kids, has taken in another needy young adult who's been abandoned and needed someone to love her and show her how to do laundry. Another case of that universal reality, that those with the least are often those who give the most. And my mom, who retired from her job of 24 years and knew when it was time to go. I see so many folks who malpractice, who stay somewhere much longer than is good for them and their patients, clients, students, co-workers, customers. I had a party for her, and 50 (mostly) women from the home store she's worked at over the years were at my house. We had a toast for her, and half the room was crying. (Me first, of course.) So energizing to see how she's continually paid attention to and loved those around her, and what beautiful juice has filled the cup. I made this dip, and I've made it a few other times, too. A few weeks ago, I was on my way home, remembered I had to bring an appetizer somewhere, did a mental inventory of my pantry and fridge, and had this concocted by the time I walked through the door. It turned out to be a keeper. And I love it when that happens. P.S. Here's a poem I wrote putting fear into the backseat where it belongs. and then to step closer? tell the story of deliverance? You could easily leave the cheese and sour cream out of this. If you do that, add a little more lime juice, olive oil or water to the bean mixture to make sure it's smooth enough. 1 very large or two medium yams or sweet potatoes, skin on and diced into 1/2"
Toss diced yams with olive oil and a little salt. Spread out on a single layer on a baking sheet, and bake until just tender, about 20 minutes. 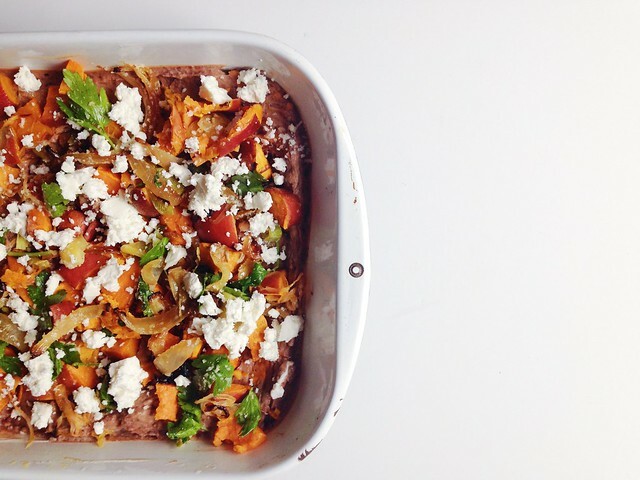 In a 9x13 baking dish, mix beans with caramelized onion, sour cream, cumin, lime, chile powder, and salt to taste. Spread evenly into the bottom of the dish. Top bean mixture with shredded cheese and roasted yams. Bake in the oven until the whole thing is warm and bubbly, about 20 minutes. Remove from oven and top with seeds, cilantro, and avocado. Serve with tortilla chips.